Bushnell 753940M Legend 3-9x40 Multi-X Reticle Riflescope 753940M FREE SHIPPING! The Bushnell Legend 3-9x40 is a versatile riflescope that makes target acquisition and aiming easy. 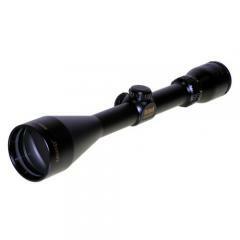 It features an enlarged field of view and generous eye relief, so you can spot your target with ease. Its adjustable power and precise click windage and elevation controls allow you to accurately engage targets at a wide variety of distances. Each optical surface features a premium multi-layer coating that maximizes light transmission for a clear, bright image even in dim lighting. The external lens surfaces also come with a hydrophobic Rainguard HD coating that breaks up water droplets, reducing light scattering. The rugged aluminum tube is built to resist recoil and other shocks effectively, and features a nitrogen fill that prevents water intrusion and fogging for effective all-weather use. ©2002-2019 CopsPlus.com: Bushnell 753940M Legend 3-9x40 Multi-X Reticle Riflescope 753940M FREE SHIPPING!